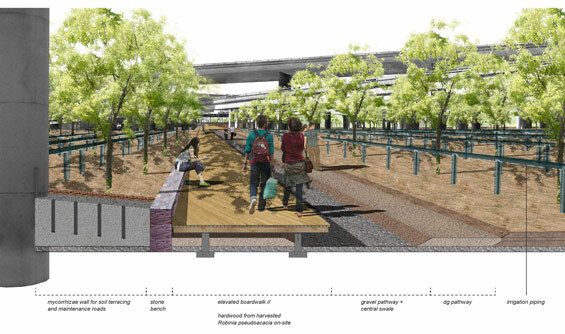 A 30-acre site of underutilized space located beneath a multi-level interchange in San Francisco, CA is envisioned as a highly productive sequestering urban forest that humanizes the street level making it accessible, safe, and enjoyable for the public. The design had three primary goals. 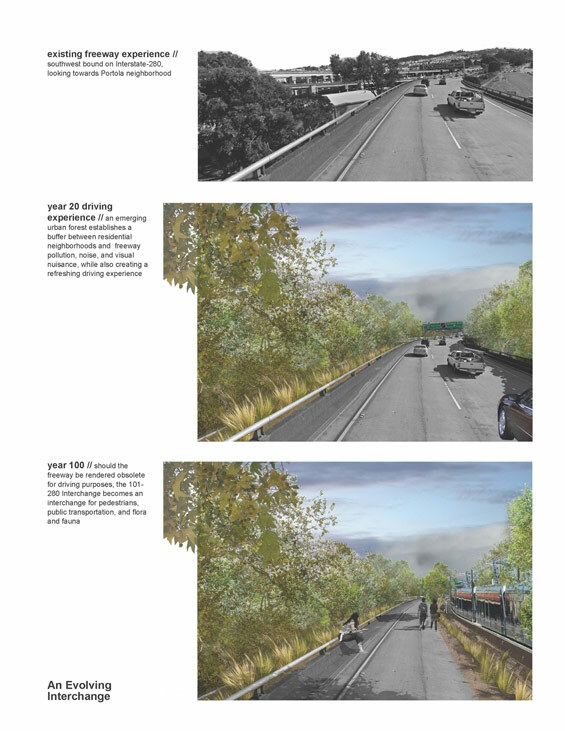 1) Combine time, process, and ecology to offset CO2 emissions from the freeway while creating a memorable place. 2) Reduce persistent flooding on this former marshland. 3) Reconnect 2 neighborhoods to each other and to the city’s largest Farmer’s Market. 30 billion tons of Carbon Dioxide (CO2) are emitted annually around the globe. The San Francisco Bay Area contributes 9 million tons annually. Currently anticipating 2 million additional residents by 2035, the San Francisco Bay Area will face inflated emissions. Recent studies suggest that densely planted urban forests can sequester CO2 to offset annual emissions. Urban forests improve air quality, provide enjoyable streetscapes, and establish buffers from infrastructure. Freeway right-of-ways represent opportune land for locating sequestering forests in cities. They are some of the only remaining vacant land in San Francisco, they are often underutilized, and are adjacent to residential areas. 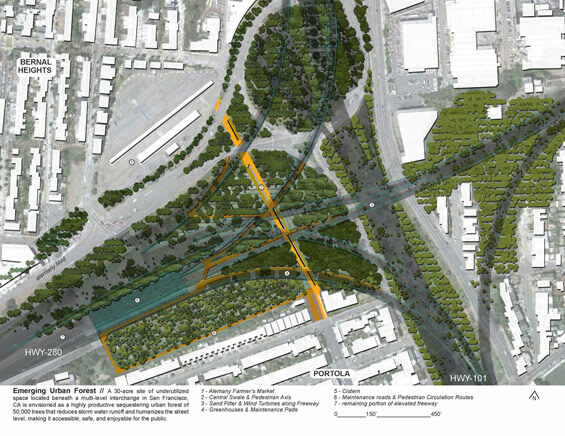 The design develops a systematic approach for planting a highly sequestering urban forest that capitalizes on existing infrastructure for irrigation needs and storm water improvements. 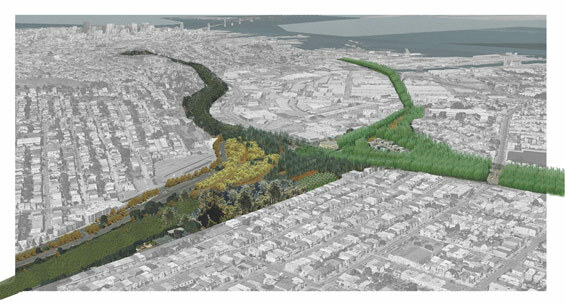 Regional contributions identified for construction guide a robust planning strategy that captures material and funding streams to plant urban forests in underutilized freeway right-of-ways throughout the entire San Francisco Bay Area. CO2 emissions were calculated for the expanse of the interchange using transit authority vehicle counts and average levels of annual emissions. (1, 2) Within the expanse of the interchange, vehicles emit 1,040 tons of CO2 annually. Research of contemporary forest sequestration techniques found that an average mature tree can sequester 48 lbs of CO2 annually (or 0.021 tons). (3, 4) Sequestering 1,040 tons of CO2 using an urban forest would require 48,000 mature trees. 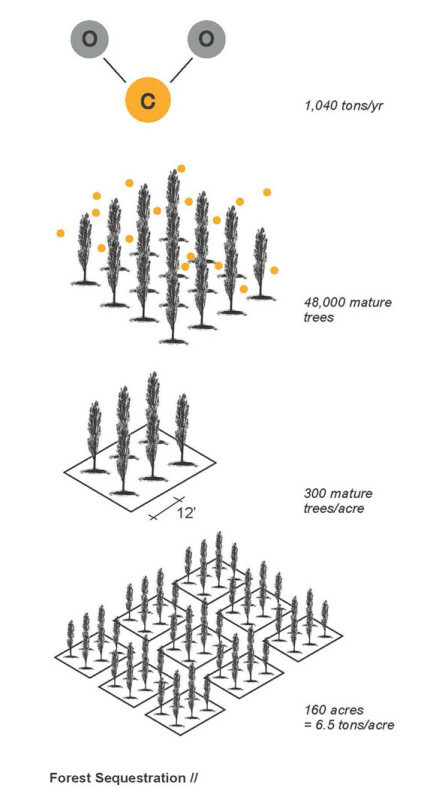 If planted 12 feet apart, 300 mature trees can fit within a single acre and sequester 6.5 tons of CO2 per acre. Design form for the site follows identified strategies, planting trees 3 meters apart and cycling the trees every 6 years through a process of growth, partial forest removal, and afforestation and diversification. 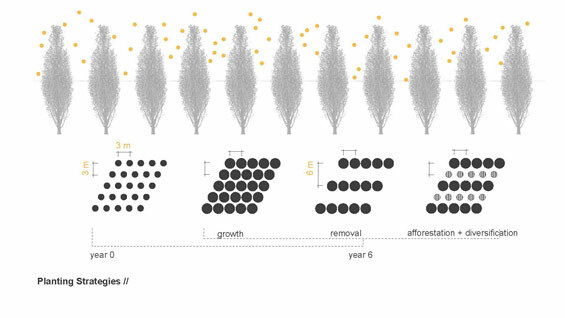 Using this planting regimen, the forest emerges over 100 years and accumulates 50,000 trees. According to New York City’s 1-million tree program, an average urban tree requires 782 gallons of water annually. (6) This design employs a multi-tiered regenerative catchment and irrigation system that latches to the existing freeway infrastructure. The system captures storm water runoff from the above freeway and irrigates the emerging forest below. A gravity-fed sand filter runs alongside the freeway, filtering storm water from existing drains while directing the water into an on-site sunken cistern. Wind turbines above the freeway capitalize on excessive valley winds to power cistern turbines for water aeration. Water is pumped through piping that extends across the planted planes. Piping is designed to move and adapt as the forest grows. A central axis serves as a swale to accommodate regular drainage, winter flooding, and/or the 100-year flood, and also acts as the primary pedestrian thoroughfare creating community linkage. An elevated central boardwalk is constructed using hardwood of Robinia pseudoacaia trees grown on-site. 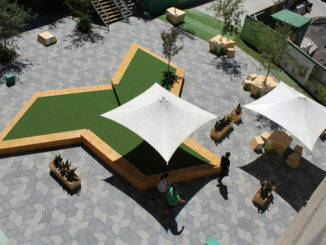 To minimize CO2 emissions in the construction and maintenance of the forest, funding and materials are locally sourced. Continuous forest cycling and irrigation strategies are projected to generate multiple city benefits: 500+ trees/year to grow the urban forest, 150 truckloads of nutritious soil/year for urban agriculture, 15.25 million gallons of storm water reduction, 39 million kW/year of generated electricity, property value increase of $900,000/year, and local manufacturing and on-site maintenance jobs. 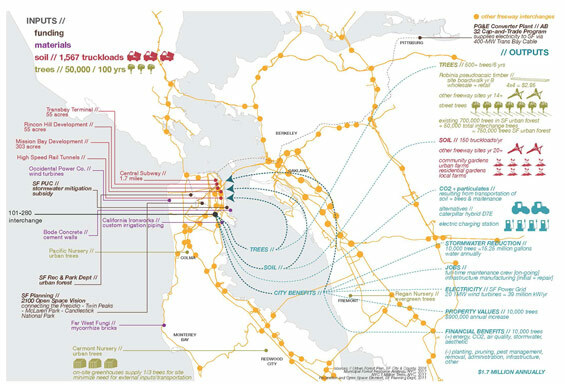 1 California Department of Transportation, “Traffic Branch Data: Year 2011,” 2011; Internet; accessed Oct 2011; available from http://traffic-counts.dot.ca.gov/. 3 David J. Nowak, “Tree Species Selection, Design, and Management to Improve Air Quality,” 2000 ASLA Annual Meeting Proceedings, 2000, 23-27. 4 EPA, “Carbon Sequestration through Reforestation,” Office of Superfund Remediation and Technology Innovation, internet; accessed Oct 2011; accessible from http://www.epa.gov/aml/revital/cseqfact.pdf. 5 S. Fang, J. Xue, and L. Tang, “Biomass production and carbon sequestration potential in poplar plantations with different management patterns,” Journal of Environmental Management 85: 2007, 672-679. 6 MillionTreesNYC, “Watering,” Million Trees NYC 2012, Internet; accessed Oct 2011; available from http://stewardship.nycparks.org/library/watering.php. 7 MillionTreesNYC, “Benefits of NYC’s urban forest,” Internet; accessed Oct 2011; available from http://www.milliontreesnyc.org/html/urban_forest/urban_forest_benefits.shtml.